The song was written by group member, guitarist, and lead vocalist John Fogerty. The song was the first released in 1969 as the B-Side to their single of "Proud Mary." (That song went to #2 on the U.S. Billboard Hot 100 and charted well internationally.) "Born on the Bayou" was the first track on CCR's 1969 album Bayou Country. Although Fogerty hails from Berkeley, California, he imagined this sort of mythical childhood and life in the bayou. The hoodoo mentioned in the lyrics is an apparition, of the magical, otherworldly kind. And "chooglin" is to have raucous good time. "Born on the Bayou" was the first song CCR played at the Woodstock Festival in 1969. They performed 11 songs on the second day, beginning at 3:30 a.m. At that point, Fogerty says, " There were half a million people asleep...These people were out. It was sort of like a painting of a Dante scene, just bodies from hell, all intertwined and asleep, covered with mud." What Fogerty likes to remember about their performance is that about a quarter mile away, he saw someone flick his lighter in the darkness and heard him yell, "Don't worry about it, John. We're with you." Fogerty says he played the rest of the show for that guy. CCR often opened their concerts with "Born on the Bayou," as it had become a signature song. It is on Rolling Stone's list of "100 Greatest Guitar Songs." The group members were John Fogerty , Tom Fogerty, Stu Cook, and Doug Clifford. Clifford says that this is his favorite of their songs -- bar none. In the spirit of 60s-style "do your own thing," this is the longer album version rather than the 3.42-minute single version, because, well, I like it better. 'Cause he'll get you now now." Just a-chooglin' on down to New Orleans. Do it, do it, do it. Oh, Lord. If you are interested in other songs by Creedence Clearwater Revival: "Bad Moon Rising," "Down on the Corner," and "Susie Q." 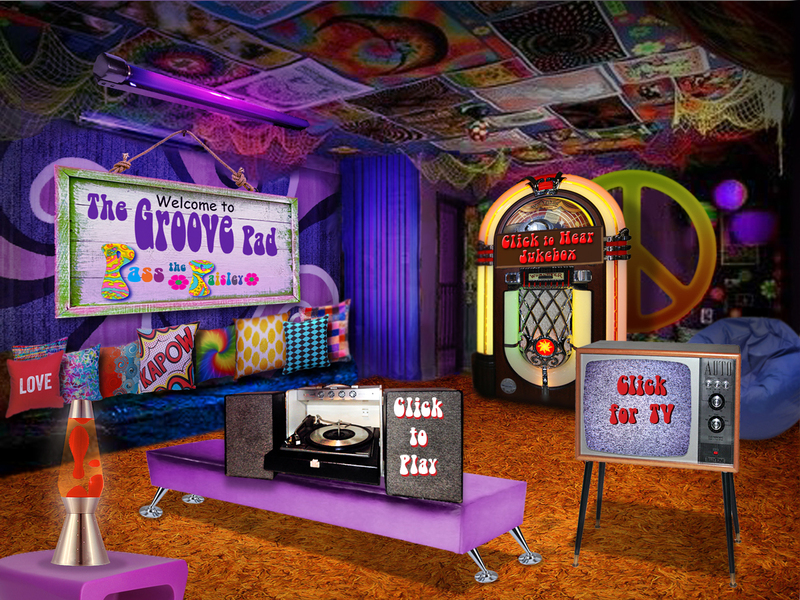 The Pass the Paisley Groove Pad is a resting stop, a place to chill out and listen to the featured song on the stereo. If the mood strikes you, click on the juke box to access and listen to the 50+ free online songs there. The TV has several channels, with selections updated twice a week. Every now and then, Pass the Paisley hosts an all-request of 1960s and 1970s songs for a Be-In at the juke box in the Groove Pad. Keep on truckin'. Hope you enjoyed "Born on the Bayou" by Creedence Clearwater Revival. A clip of The Kinks on Shindig! (1965). They sing “All of the Day and All of the Night.” Running time 2:16. Chatty Cathy toy doll commercial. Running time: 105. The Man from U.N.C.L.E. TV intro. Napoleon Solo (Robert Vaughn), Illya Kukyakin (David McCallum), Alexander Waverly (Leo G. Carroll). Running time :42. Please click on the Juke Box for 50 or so selections. Enjoy!